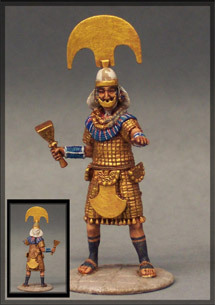 The Moche Empire reigned from AD 100 to the end of the 7th Century. 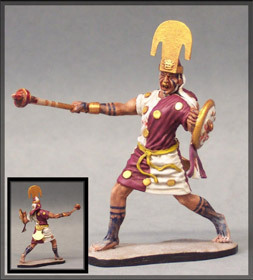 They were a pre-Columbian tribe ruling a 220 mile coast and desert region between the Andes and the Pacific (Peru). They preceded the Inca by 1,200 years and their refinement of art and technology rivaled the Mayan empire of the Yucatan Peninsula. The Lord of Sipan was buried under an adobe mud brick pyramid with loyal men and women and even his dog, some of their feet had been removed perhaps symbolizing a desire to stay with and guard the warrior priest even after Death. I first "discovered the Lord in a museum in Huaraz, Peru. There was a replica of the Excavations (of Sipan in the Lambayaque Valley) showing the occupants of the mausoleum and their ornaments and finery. I was taken by the Moche Fashion, the huge golden crescent head-crests, back flaps and nose rings. The Warrior priest himself had an array of fine garments jewelry and regalia buried with him. I returned to New Zealand with the intention of sculpting him in all his splendor, three years later here he is accompanied with one of his warriors adorned with the characteristic blue war paint on arms legs and face.